An opossum's tail and opposable thumbs on the hind feet come in very handy because they are the primary "tools" an opossum uses to climb trees. An opossum's tail is hairless, long and very flexible and capable. An opossum climbs trees either to run away from predators or to find food in birds’ nests (eggs or young birds). Although opossums are often presented in cartoons as animals that hang from their tails from trees, this is not actually so, because an adult opossum couldn't keep his weight with his tail for any long period of time. Young opossums do like to play the game of hanging by their tail from trees, but this is also short-term, not something that lasts till adulthood. The primary usage of their tails is to help them while climbing up the trees, moving from one branch to another, keeping their balance during this climbing and descending. Opossums use their tail during walking and running for balancing purposes. It has also been noted that opossums have carried grass or bunches of leaves to their temporary nests with them, which means that they can use their tails for specific purposes. Opossums are often considered to be a bit sluggish and not very intelligent animals because when they have been captured during the day, they don’t typically fight back. If caught by the neck they would simply give in and play opossum. Not fighting back can be a really bad strategy, especially if the animal is captured by a larger predator, which has lead many to consider opossums stupid animals. However, it should be noted that opossums are primarily nocturnal animals, i.e. they are active during the night – only on rare occasions are they active during the day. This is one valid explanation for the belief that opossums are sluggish – they simply don't have that much energy during the day, which is why opossums seem "slow" during the day. However, their handy usage of their tail proves that opossums can organize themselves very well. They use their tail for a wide variety of activities, including balancing, climbing, running and carrying things around. 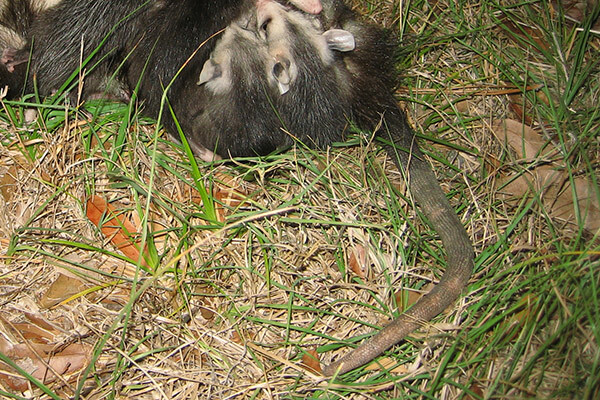 Young opossums hang from branches attached with their tails, which shows their playful quality. This shows that opossums are quite capable and skillful rodents that use their tail as efficiently and effectively as if it was a fifth limb, which is a remarkable quality. Go back to the How to Get Rid of Possums home page.